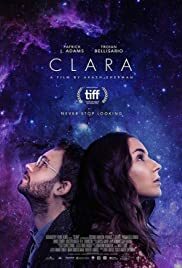 CLARA is a rare science fiction romantic drama made in Canada’s own Toronto that disguises the fact quite well, passing of as an American film in an unnamed city and in unnamed university. Lots of references to NASA gives the impression that CLARA is an American made movie. The film opens with Dr. Isaac Bruno (Patrick J. Adams) delivering a lecture on astronomy to an auditorium full of eager students. He is quizzed by one who challenges his disinterest in the field. It is here that Isaac draws a parallel between finding true love (L=0), which equates to a zero to finding life in the other parts of the universe. In the next scene, Isaac is fired from the Faculty by the dean (Jennifer Dale) for – it all sounds really funny – “misappropriating telescope time’. Obsessed with his work, he decides to conduct studies on data on his own and seeks the help of an outsider who turns up to be his romantic interest. Clara (Troian Bellisario) is a sort-of free-spirit who shares Isaac’s fascination of the wonders of the universe. Their unlikely collaboration leads to a deep connection and a profound astronomical discovery as they detect patterns in stellar data. She also opens Isaac up to the outside of space research and data. CLARA contains spots of uplifting moments. One cannot go wrong with the music of Bob Dylan as Clara picks one Dylan’s vinyls and plays it. The lyrics: “She once was a true love of mine” also tells the story of Isaac. The script, also written by director Akash Sherman often falls into cliched territory. Like the line spoken by Clara; “Do you want something more than all this, for the universe to surprise us?” Clara and Isaac then kiss for the very first time. The script also plunges the audience into the here and now of its two characters. But nothing is known of the two characters’s past backgrounds. At one point, the free spirited Clara appears to be a character just out to change the life of another subject and then move on to another. This premise made a very interesting movie in the 70’s called SWEET NOVEMBER in which Sandy Dennis picked a character every month to change a life for the better. November was played by Anthony Newley who falls in love with her but she moves on. CLARA sort of follows this story as Clara thus moves on while Isaac gets on with an improved life. CLARA has an ending (unfortunately unable to be revealed here as it would be a massive spoiler) that badly undermines whatever message the film intended to portray, thus betraying the entire movie. CLARA is a sad film about two lonely people who eventually find each other, only to find that fate is not on their side, despite the good connection. It is a sad premise lifted by the story’s setting in the wonders of space. The resulting film is, as expected, a mixed bag of tricks, with some good moments as well.